Pre-school. We’ve been there and have the proud parent tee and mascara stained tissues to prove it. Other than getting your kid all excited, another important aspect is getting them prepped. But what do you really need? We asked our Head of Retail, Helene, to shed some light on her must-have products. As a parent herself, she’s done it too. Here’s what she picked, and why. With the new distractions of playing and learning that goes on at pre-school, kids can sometimes forget to pop to the loo. Helene knows from experience with her two children that, this can in turn, ‘lead to little accidents’. That’s why this Skip Hop Grab & Go Wet/Dry Bag is a must. Featuring separate zippered pockets for wet or dry items, the waterproof PEVA lining means those wet clothes don’t dirty anything else. It’s also great for nursery staff to find the clean, spare clothing quickly, and essential to separate the wet items from the rest of the bag too. Genius. 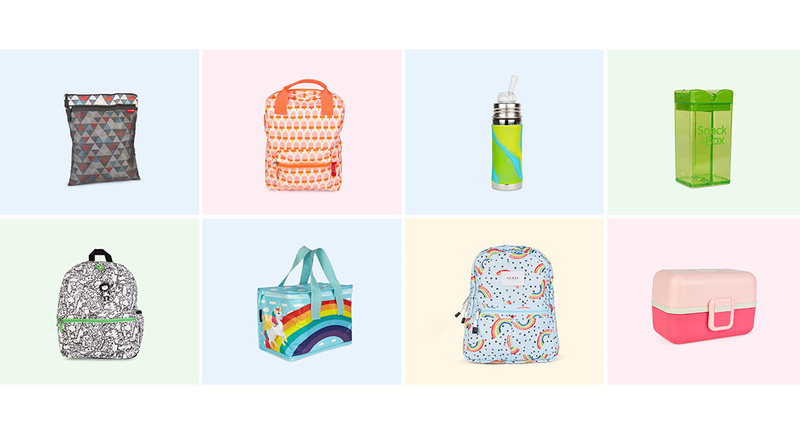 According to Helene, a backpack with a unique print can really make a kid feel confident on their first day. This Engel Ice Lolly Backpack with it’s retro design, is a perfect choice. ‘We picked Engel because of it’s eco-values,’ she said. ‘It has an outer made of recycled juice bottles, so it’s stylish and environmentally friendly.’ The main compartment is large enough to fit an A4 handbook, which is great for their learning journey, small lunchbox or their toys, and there’s an outer pocket for smaller stuff. Awesome. Helene knows that we’re all, ‘becoming conscious of plastic-free at the moment.’ And that’s why she recommends the Pura 11oz Straw Bottle. Made from stainless steel it keep drinks cool, while being light enough for kids to hold. ‘Because these have volume markings you can easily see how much they’ve drank throughout the day,’ she added. Most pre-schools ask you to supply snacks for your tot. But some little pots mean that fruits and other pieces just get mixed together, which, in a toddler’s eyes, is the end of the world. Helene gave a thumbs up to the Precidio Snack in the Box, which she says, ‘changes the game.’ She loves how it features twin pop-up lids, which let you easily pour in their fave snacks, while keeping them separate and stopping them from going soggy. ‘The Sunnylife Kids Lunch Bag keeps food and drinks hot or cool for up to three hours’, says Helene. ‘An added bonus when pre-schools don’t have a fridge.’ Add to that the cool design, easy to carry handle and ample space for a snack pot and drink, and it’s a great pick as a play-school lunchbox'. State Bags were picked by Helene because of the brand’s ethos. For every bag it sells, it hand delivers one full of tools, to a deprived kid in the US. But, it’s not the only reason why they’re great. The State Mini Kane Printed Canvas Backpack features fun, hand drawn prints and a single zipped main compartment that fits an A4 book. A front pocket and side velcro pockets store smaller bits. Soft, padded, simple to adjust straps mean kids will be happy to carry it themselves too! It’s important to keep kids eating balanced meals even when they’re not with you, and a lunchbox that has lots of different compartments makes this so much easier to do, helping you to include a range of different healthy snacks in different quantities. Kids love variety afterall! To tackle this, Helene recommends the Monbento Tresor Kids Bento Box, which features a range of compartments to help you mix and match foods. Oh, and it can also be customised, meaning no more playground mix ups. Bonus.